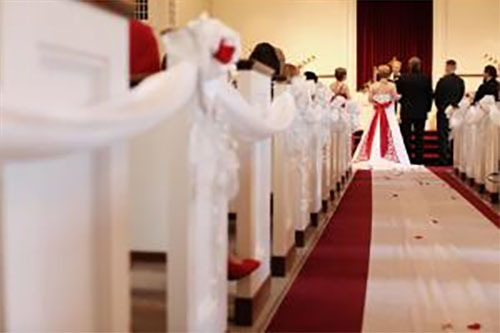 Trinity Church provides a beautiful setting for this most special and sacred day in the lives of a couple. The pastors and staff here consider it a privilege to be a part of this important occasion. We host weddings for members and nonmembers alike. You must submit a request to reserve the church on your date. Our office manager will contact you to let you know if your date is available. A deposit will then hold your date, and will be applied to the total cost of your wedding. Please read the schedule of fees, and submit your application. It is our policy that one of Trinity’s pastors must officiate at all in-house weddings, although we are happy to work with another pastor or priest if you would like someone to co-officiate. If you have a preference which one of Trinity’s pastors would conduct your ceremony, please specify that when you submit your application. All couples must participate in counseling prior to your wedding. You will be required to meet with the pastor a minimum of 2-3 times before your wedding, and it is up to you to initiate the first counseling session. We suggest choosing a time up to six months prior to your wedding. Call 513-831-0262 to make the arrangements. Congratulations! We look forward to helping you plan your day and prepare for your life together. Please download our full Wedding Brochure (also available at the church office) for complete information. You can also submit our Wedding Request Form online to get started. Trinity Church is here to provide comfort at the passing of a loved one. Christ is our hope for eternal life and we offer this hope to the surviving family and friends that their beloved is now in God’s eternal charge. Our pastors and staff would be honored to provide a celebration of life service at the church, at the funeral home of your choice, or at the graveside depending on the family’s preference. Please call the church office at 513-831-0262 for assistance during office hours. Either of the pastors can be reached outside of office hours by calling Kirk Peterson at 513-831-2551 or Amanda Moseng at 513-248-9140. As you plan the service, it is helpful to consider scriptures, songs, or readings that your loved one or your family might find meaningful. The pastor will be able to make suggestions if you wish. It is also an option to have a member of the family or close friend share a short eulogy. If you would prefer to pre-plan a service, please call the church office and arrange a meeting with one of the ministers. May the Lord be with you and give you strength. Contact the Office Staff at Trinity United Methodist Church today for more information.